The sesame paste is made from the fried sesame seeds. It is thick and mushy. It has a sesame flavor and can be seasoned and served. Sesame is rich in nutrients such as protein, oil and amino acids. Chinese medicine believes that sesame is sweet, flat, has the effect of nourishing blood and eyesight, phlegm and blood stasis, Shengjintong milk, and benefiting the liver and raising hair. It can be used to treat high blood pressure, white hair, anemia, sallowness, dry stool, and less milk. Equivalent. Some small industrialized sesame pastes in China have been layered after a period of time. The upper layer is the clear oil layer and the lower layer is the slag layer. This does not facilitate the deployment of sesame sauce, but also affects its appearance, causing economic losses and food troubles for manufacturers and consumers. The ground sesame paste is a solid-liquid heterogeneous thermodynamically unstable system. 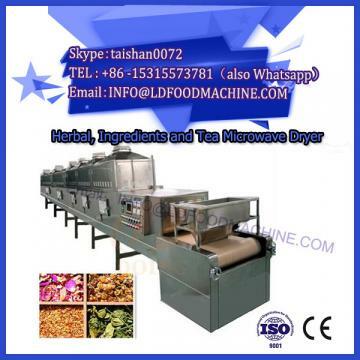 The microwave drying machinery technology developed by the company can solve the stratification phenomenon of sesame paste. The sesame is processed by the sesame paste making machine and added to the emulsion. The liquid phase is mainly sesame oil, and the solid phase is mainly a combination of denatured proteins, carbohydrates, lignocellulose and ash, and proteins and other substances. The hydrophilicity of the polymer compound in the solid phase is far stronger than the lipophilicity, which is not conducive to the stability of the sesame paste. The sedimentation rate of the solid phase granules of sesame is proportional to the particle diameter and the difference of the density of the two phases, and inversely proportional to the viscosity of the oil phase. The small particles in the solid phase of the sesame form large particles having a density greater than the density of the oil droplets, the oil droplets floating up, and finally separated from the solids at the bottom. The difference in density between solid-liquid two phases of sesame sauce and liquid phase viscosity are difficult to change. Therefore, to control the stratification of sesame paste, the main method is to reduce the interfacial tension between the solid phase particle diameter (150 mesh to 180 mesh) and the solid-liquid phase. Emulsifiers such as phospholipids, sucrose esters and monoglycerides can increase the affinity of the solid-liquid two phase and prevent small particles from forming large particles to settle. At present, an emulsifier is added by adding an emulsion to the ground sesame sauce while stirring. Based on this test, the timing, method and ratio of emulsifier addition were studied. It aims to increase the mixing effect with sesame sauce, reduce the production of sesame paste, and improve the stability of sesame sauce.